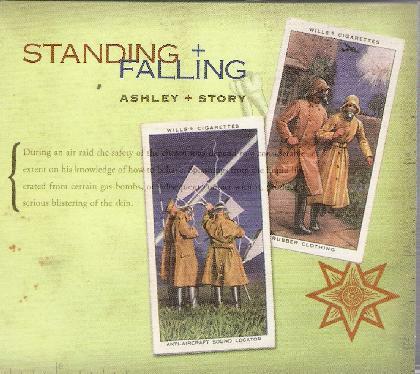 Ashley + Story - "Standing + Falling"
Standing + Falling is the third collaboration between noted ambient texturalist Tim Story and Ohio guitarist/sound designer Dwight Ashley. Like its immediate predecessors, A Desperate Serenity and Drop, Standing + Falling is an aural gateway to the quieter realms of experimental sound composition that hover just beneath the grittier, more violent excesses of such post-industrial ambient engineers as Lustmord and Biosphere. The Ashley/Story symbiosis works to such perfection on Standing + Falling that it's often difficult to discern the relative contributions made by either to the ten tracks that comprise the album. More important, of course, are the tracks themselves, each of which seems to evolve its own specific environment according to the circumscribed principles of both the recording process and the instrumental apparatus used to bring the process to fruition. For instance, the delicate unresolved chords of "Wax Staircase" evoke the transient moments of clarity that often accompany a lucid dream. The hushed backdrop of gliding synthesizers and infinitely sustained guitar touches deep resonances far below the surface of waking consciousness. The same can also be said of the eerie "Ohmen," which offers a darker and more sinister route into the country of sleep. Oddly dissonant waves of fractured sound surge over an ocean of modulated electronics, numbing the listener into a quiescence that belies the track's aura of foreboding. The 21-minute "Dysnipsia," however, is clearly the centerpiece of Standing + Falling. Slowly emerging out of multiple crescendos of icy synthetic strings, "Dysnipsia" suspends one in a nether world of light and shadow, sound and silence, vision and memory that evokes a kind of "country surrealism." Standing + Falling is, in sum, a haunting voyage through an exhibition of impressionistic sound portraits that, when taken together to form a continuum, offers a compelling glimpse into the shadowlands of other worlds and other times. For more information you can visit the Ashley/Story web site at: http://www.ashleystory.com. Visit the Nepenthe Music web site at: http://www.nepenthemusic.com.